If there’s one travel bucket list item I’ve been super stoked and eager to tick off for a while it’s a whale shark encounter. Technically I scuba dived with a whale shark in Koh Tao a few years ago, but I didn’t have my GoPro with me (typical hey?!) and it was a while back now so I really wanted to see another and capture the whole thing. 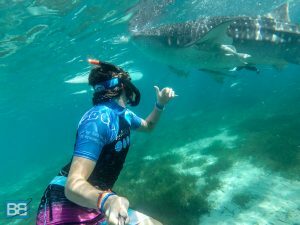 Having spoken to heaps of my freediving buddies who have already spent time in the Philippines they all raved about swimming and freediving with whale sharks in the village of Oslob. It was something I kind of viewed as ‘cheating’ but seeing as I’ve seen one completely by chance I thought I could excuse it! So when I hit up the Philippines for some freediving this month a trip to the whale sharks was top priority and to say I was stoked for it was a massive understatement! The Early Bird Catches The Whale Shark!? After a ridiculously early 4:30am start we embarked on the 3 hour journey from Lapu-Lapu (where we were free diving) to Oslob. Luckily for me I can pretty much sleep anywhere so after sprawling out in our minibus I woke up when we arrived! I’m not quite sure what I was expecting the whole thing to be like, but I was pleasantly surprised to discover that the place was quite quiet – a few other sleepy looking travellers and locals but nothing like the circus type affair that I feared might be the case. After paying our entry fee and filling out some forms we got changed and were greeted by a friendly Filipino guide who ran us through the rules of the whole experience – the basics gist of it was “NO TOUCHING” or getting too close, but I was also surprised (and impressed) that they even went as far as banning sunscreen in the water to protect the sharks…a move I highly respect. Without any waiting around (we were some of the first to arrive, which was awesome!) we jumped onto a tiny outrigger paddle boat and headed about 20m offshore. As we grew closer I saw a few fins break the surface which got me super stoked – but when the guys informed us we could jump in I looked down into the clear water to see a 12 foot whale shark literally staring back at me! Needless to say I slipped my fins and mask on pretty quick, grabbed the GoPro and jumped overboard! With beautiful water clarity and barely anyone else in the water I spent the next half hour surrounded by about 5-8 whale sharks. Admittedly they weren’t fully grown, but these creatures are still massive yet incredibly agile in the water. Although one of the biggest rules was not to touch or get close to the whalesharks clearly no one had informed the whale sharks themselves and they happily swam straight at me as I flapped around trying to avoid their gaping mouths! They’re filter feeders incase you were wondering so I was never actually going to be eaten! I cruised in amongst them, enjoyed swimming down into the blue under and around them and generally went into full blown photographer mode trying my best to capture the beauty and epicness (yeah I just typed that!) of the whole thing. For someone who loves exploring the ocean and it’s marine life my stoke was running at a massive high! As they swam around (apparently oblivious to us!) and hoovered their way through the water with their mouths at full stretch I felt honoured to share the water with them. I know that sounds massively hippy like but it’s true! 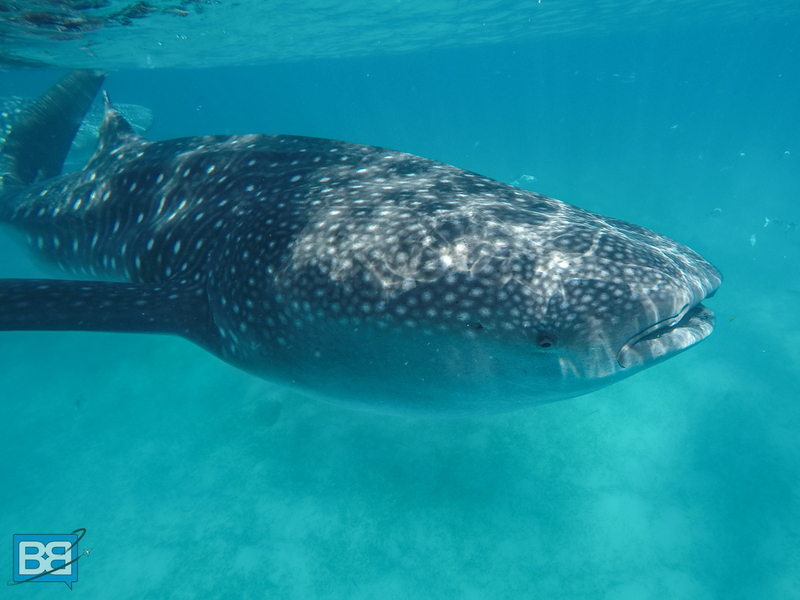 We know very little about the lifestyle of the whaleshark, where it breeds or their migration patterns, not to mention the fact they’re endangered so being able to get this close to these gentle giants is a bucket list item I won’t be forgetting for a while. Our half hour slot flew by and I was soon reluctantly removing myself from the water – stoked to check out my pictures and annoy some of my dive buddies! One of the biggest things I was worried about was the eco-tourism side of things, which the whole thing is often touted as. On the wide world of the inter web and from fellow travellers I’ve heard mixed reviews of it being cruel or exploiting the whale sharks. Having done it myself and gone in with an open mind my opinion of it is that although it’s not ideal (that would be simply crossing paths with whale sharks by complete luck) it’s not something I see as a bad thing. 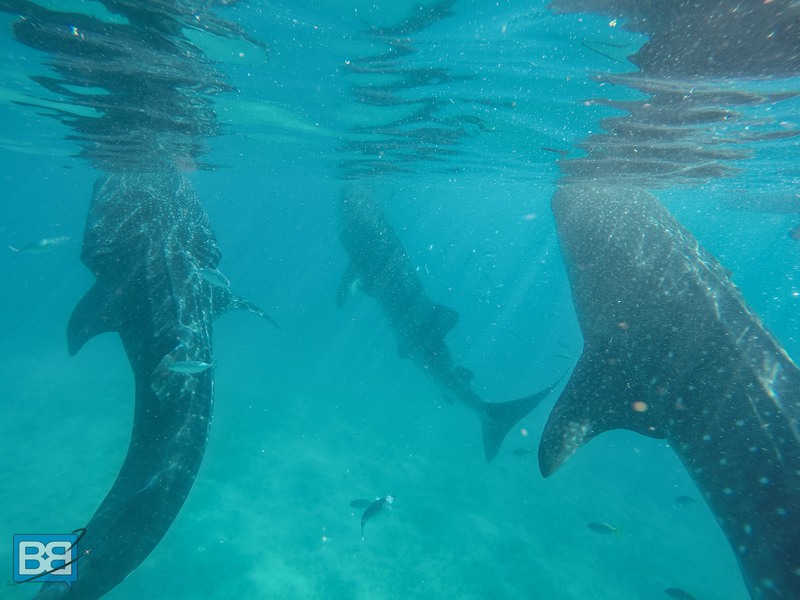 The whale sharks themselves are totally wild, not netted in and free to leave at any point. In fact once the 7-12 time slot is over and the feed is stopped they simply disappear back into the blue! Lets face it if a creature that big and fast didn’t want to be surrounded by travellers it would swim off pretty fast! In a strange parallel I guess it’s kind of the same thing as the dolphins in Monkey Mia over in WA – sometimes one appears, sometimes a solid few. It’s all down to chance and up to the whale sharks. One thing I did notice was the fact that the government now manages the whole thing – rather than the free for all that apparently used to happen. Numbers are limited and access is solely by paddle boat, to minimise any risk to the creatures themselves. As I previously mentioned you’re given a short but strong briefing on how to behave, asked to remove any sunscreen and there’s a hefty set of fines and even imprisonment for anyone touching the whale sharks. In the water throughout there were guides keeping an eye on everything, but I also noted a lot of people with ‘RESEARCH’ t-shirts on, who appeared to be shooting videos and photos of the whale sharks – a creature that we know remarkably little about. 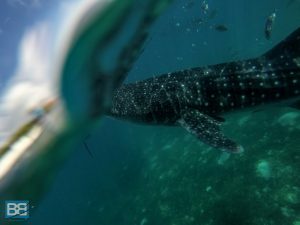 I also spoke to some business owners in the Philippines who all welcomed the government control and restrictions over the whole thing, saying that before hand it was done by ‘cowboy dive schools’ and whale sharks were frequently marked by propellor blades in the chaos that surrounded it. 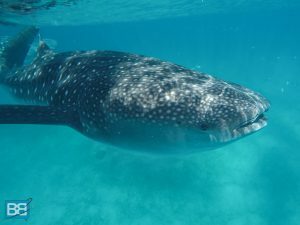 They also noted that like many parts of the Philippines it’s a great source of income for the local people, who are now employed in many aspects of it and that if it wasn’t going on the whale sharks themselves may well have been eaten or finned like elsewhere in the country. The bottom line is that although I’d rather see a whale shark in it’s 100% natural habitat the experiences in Oslob is a far cry from them being in captivity and the steps that have been taken to turn it into an eco tourism spot are steps in the right direction – meaning I can recommend it to people with a happy conscience. The whole day was pretty pricey in regards to my budget out here in the Philippines – 2,500PHP each for the van (obviously this can be cheaper if there’s more of you! ), 1,050PHP for the 30 minute slot with the whale sharks and 20PHP for the waterfall entry…roughly £50 all in. Was it worth the splurge? Totally! Sometimes on the road if you really want to do something you have to bite the bullet and shell out the cash! 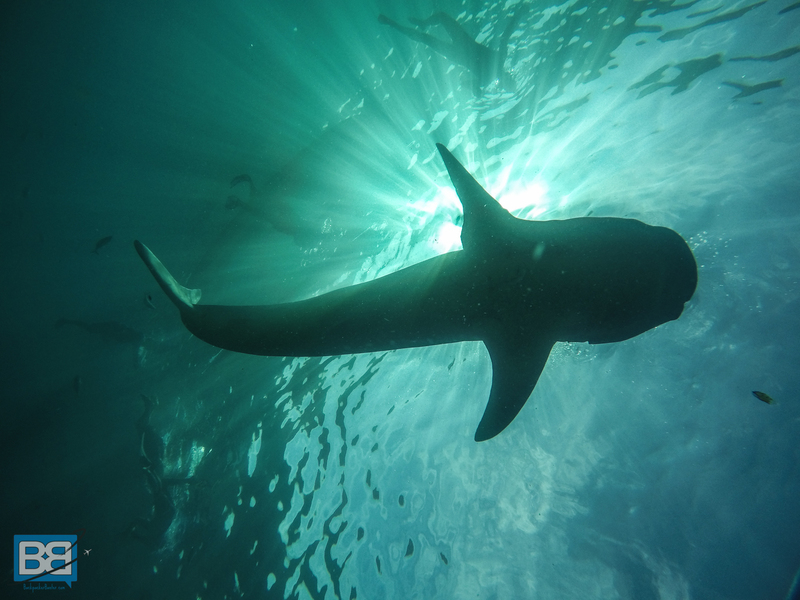 Have you swam with whale sharks – how did you find it? Great to read your post! I’m hooked after my experiences in Mexico and Honduras, and would definitely go again if I get the chance to see the Philippines. I agree about the splurge. If there’s one thing on your travels you ever should splurge on, this is it! Wow going for a third time hey Arianwen! I may have to sop destinations with you so we can compare!hahaha! Wow this sounds amazing. Would love to do that. Was epic fun Elin – add it to the bucket list! So happy to hear you made it to the Philippines, snorkelled with the whale sharks and surfed in Siargao! Can’t wait to get back there… ASAP! Yeah I have no clue why it’s taken me so long to explore here…it’s incredible! Already planning a return for January…anywhere you’d recommend? It was actually pretty shallow Jodie so I’m sure it wouldn’t be too much of an issue – you can always hold onto the boat and snorkel! Stoked you like the site Summer! I should hopefully be back again soon, would be great to meet you and share some waves in Siargao! Snorkeling with whale sharks, ummm YES! Looks and sounds like an amazing day trip. Yeah it was epic – on your bucket list too Adam? number. They don’t feed them like they do in Oslob. You should also try the thresher sharks in Malapascua, Cebu. Thanks for sharing! My boyfriend and I are going to cebu in less than a month and hearing that it was such a great experience for you, now I can look forward to our dreams coming true. Thanks! Have an amazing time, it’s a great experience! What if you really don’t know how to swim?Cani still see the whale shark? If you’re not good with swimming they can provide life vests and you can keep hold of the boat so you’ll still be able to see them no worries! I just booked a minibus/taxi transfer down there and you can sort everything out on arrival easy as! Wow! Indeed, the early bird catches the whale sharks. Thanks for this. I’ve been there a lot and whenever I go there to watch the whale sharks, I still feeling amazed and stunned at how beautiful those creatures are. Thanks for sharing this! February 21st 2019. We are stuck at 7am with hundreds of people queuing for a spot on a boat. We re number 168, waiting for an hour. They just called 106. I see 24 boats full of people in perhaps a 50m long stretch of sea. If i had not seen whale sharks twice in the wild while diving I d be mighty pissed off. I asked locals and it s like this everyday, not like today s some kind of holiday. So, well… i guess things have changed.